The New York Times is quoting unnamed senior Obama administration and Congressional officials as claiming that the United States is accusing Pakistan of illegally modifying American-made Harpoon anti-ship missiles to expand its capability to strike land targets, a potential threat to India. American military and intelligence officials reportedly say they suspect that Pakistan has modified the Harpoon antiship missiles that the United States sold the country in the 1980s, a move that would be a violation of the Arms Control Export Act. Pakistan has denied the charge, saying it developed the missile itself. The United States has also accused Pakistan of modifying American-made P-3C aircraft for land-attack missions, another violation of United States law that the Obama administration has protested. According to a senior Pakistani official, Pakistan has taken the unusual step of agreeing to allow American officials to inspect the country’s Harpoon inventory to prove that it had not violated the law, a step that the US administration officials praised. Independent experts are also skeptical of the alleged American claims, according to Asian Defense blog. Robert Hewson, editor of Jane’s Air-Launched Weapons, a yearbook and Web-based data service, has said the Harpoon missile did not have the necessary range for a land-attack missile, which would lend credibility to Pakistani claims that they are developing their own new missile. Moreover, he said, Pakistan already has more modern land-attack missiles that it developed itself or acquired from China. According to Tech Lahore blog, Pakistan's Raa’d missile has been mated with Mach 2 capable Mirages and is now being integrated with Pakistan’s new fighter, the JF-17. 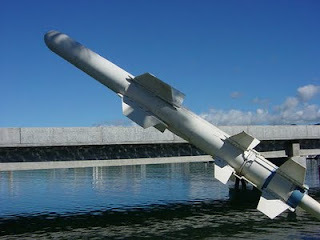 The missile can be launched from a stand-off distance of almost 500km and employs more sophisticated guidance than the Harpoon. This raises the question as to why would Pakistan want to attack land targets with a slow, bulky aircraft like the P-3, firing shorter range Harpoon missiles, when it’s air force already has almost 175 Mirage aircraft with Raa’d cruise missiles and recently added in-flight refueling capability? “They’re beyond the need to reverse-engineer old U.S. kit,” said Mr. Hewson about Pakistan's current capabilities. “They’re more sophisticated than that.” Mr. Hewson said the ship-to-shore missile that Pakistan was testing was part of a concerted effort to develop an array of conventional missiles that could be fired from the air, land or sea to address India’s much more formidable conventional missile arsenal. Recently, the US has signed a nuclear cooperation deal with India and offered to sell over $2 billion worth of sophisticated weaponry, further enhancing India's military might. Coming just a week before the $7.5 billion aid-to-Pakistan bill goes to the US senate, it is clear that the timing and the motives of Eric Schmitt and David Sanger of the New York Times “leak” are highly suspicious. It fits a pattern of "leaks" in Washington to either defeat or add poison pill amendments to any legislation likely to aid to Pakistan. Such well-timed "leaks” to the New York Times, known for similar well-timed "leaks" about Iraq WMDs prior to the ill-conceived US invasion of the middle eastern nation, are most likely inspired by the Israeli and Indian lobbies in Washington who are irrevocably opposed to any US assistance to Pakistan. Past hypocritical denials of US weapons to Pakistan while offering modern offensive weapons to India has been a blessing in disguise for Pakistani military and its defense industry. Every time US has embargoed or quibbled over some insignificant little "arms control" violations with Pakistan, Pakistanis have responded to the challenge by developing their own indigenous capabilities. Such developments not only help strengthen the nation's defenses, domestic defense production also aids in developing human skills, enhancing arms exports and providing badly-needed jobs to many. West is one hell lot of crooks who try to twist and turn the facts to their convenience. I am not getting into the details of whether the claim of Americans are right or wrong, but the way in which it has been brought when MARSHAL plan of west to revive pakistan has come to discussion. Further american are now wary about the growing the coziness between pakistan and china where china wants to create a nuisance factor for india growth ambition as it feels that usa is promoting india as a nuisance value for it growing ambition. Finally i feel every country requires to fights its own battle and nobody is going to help anybody unless it is usefull for themself. Today USA is NOT HELPING india by the nuclear deal but it is opening up a country for its defense industry to sell its equipments. I think you are right, Riaz.. it was a mis-aimed leak. But Pakistan-US relations are really tense at the moment, and the way it looked to me the US was really on the back foot over there. The rumour mill about the new Embassy is out of control.. and the US doesn't know how to dampen the flames. They really are NOT filling the place with marines.. but you try now persuading any ordinary Pakistani that they are not. NY Times Columnist Tom Friedman has written very critically and extensively about how the design and size US embassies and America's obsession with security has alienated even the US allies around the world. In a column titled "Where Birds Don't Fly", he described how the Turks are unhappy with the new US consulate in Ankara. Fascinating. Thank you for that. I could add some very amusing stories from London and the dramas with the US Embassy there. In the end, they made life in Grosvenor Square SO intolerable for the other residents (some of whom were also quite rich and powerful) that the landowner the Duke of Westminster REFUSED to renew their lease on the property and they had to move elsewhere. I think the US Embassy in Kensington Palace would simply reinforce the US imperial image. Don't you think the Queen did Americans a favor by refusing? Isn't that what friends are for? No doubt, Mr.Haq, you alone are doing great!!! ...and brief work on the subject... The most beloved feature of your work is that you place related stuffs at the bottom of the post. Thanks. If you disagree with the article in NY times pick on the author and the American agencies who leaked the information. Why blame India or Israel for it?